Wireless iPad Piano Control via the PNO3 player piano system, by QRS. PNO3 Makes for an Amazing Wireless, Out-of-Sight Player Piano Experience. 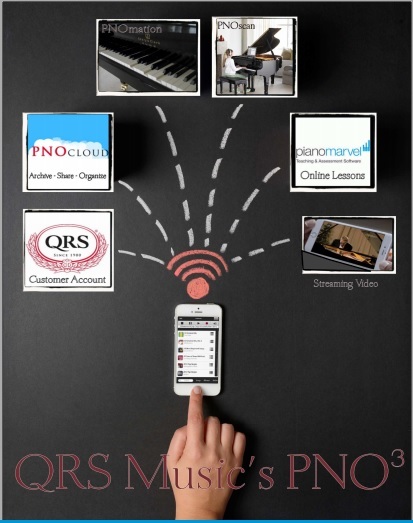 The QRS PNOmation II is the predecessor to the newest, latest, and "greatest released" QRS PNO3, which is now taking the industry by storm, both in the role of piano playback and piano recording technologies. Web-enabled devices to operate the PNO3 system include: Apple watch, iPhone, iPod touch, Android smart phones, Android tablets, smart watches, Kindle Fire, and others. iPad users can also now use their tablet to control their player piano via Wi-Fi using the new PNO3 playback and record system. Musicians who want to set up a wireless smart phone player piano system can now do exactly that, with the latest version of the QRS Music Technologies instrument automator. The PNO3 system can be installed in most any grand or upright piano, whether it's made by Steinway, Yamaha, or any other manufacturer. Furthermore, if you already own a player piano system with MIDI In/Out ports, you can upgrade to this system, seamlessly (see below). As leader and pioneer in the player piano industry, QRS PNOmation PNO3 features a state-of-the-art experience, being strides ahead of what other player piano systems have to offer. With the previous PNOmation system and all other player piano systems, users needed to install a visible front-end controller directly underneath the keyboard section of the piano. This control box, when it was used, provided a means to copy music from CDs, and a slot for memory cards to play through the system. The PNO3 system doesn't require the use of a visible control unit, so it doesn't alter the appearance of your piano. All of its components are designed to fit inside of the piano, and the system is operated over a Wi-Fi connection. IN fact, you can even "hide it" and "wear it", underneath your clothes, to be exact, on your watch (see iWatch photo). You can actually watch a LIVE DEMONSTRATION of the QRS LIBRARY, as you operate it on a device that you may already own, such as an iPad, iPhone, iPod Touch, Android device, or any web-enabled smart phone, laptop, or tablet. Caution and WARNING: Some songs in the QRS Song Library may not be appropriate and/or suitable for children under 18 years of age. If you are under 18 years of age, you may NOT enter or use the QRS Songs Library. Parental supervision is required. 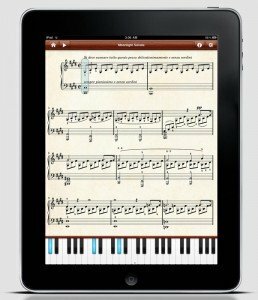 Wireless iPad, smartphone, and tablet "piano control" to operate a player piano system is now a reality. Downloading the remote control app is optional. 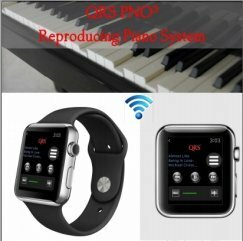 QRS PNOmation PNO3 features a web-enabled user interface that provides you with absolute control of the piano and all of the system functions, including volume level, balance, track selection, and muting. Furthermore, it gives you access to the entire music library of QRS Music Technologies, Inc. As a bonus for purchasing the system, you are entitled to free access to the QRS library for an introductory period of 90 days. That will give you access to thousands - approaching 12k songs to date - of titles in the QRS library. To see an INTERACTIVE DEMO of the ENTIRE SONG LIBRARY, click here. The PNOmation PNO3 player piano system also features seamless integration with the PNOscan MIDI record strip. This top of the line optical MIDI recording tool makes use of high-precision optical sensors that serve to accurately record every piano key motion made. Actively and optically "scanning" each key at 1,000x per second, PNOscan is the MIDI recording tool of choice of many professional piano players and musicians. Never miss a note or nuance of your musical compositions with QRS PNOScan 3. Install QRS PNOmation and you will have a player piano wireless control system that you can use with the greatest of ease. It's as simple as entering the music room, pulling out your iPad, iPhone, Android, or other Wi-Fi enabled device, and tapping the QRS Music app's interface. Your piano will immediately start making music, or you may begin recording, instantly. 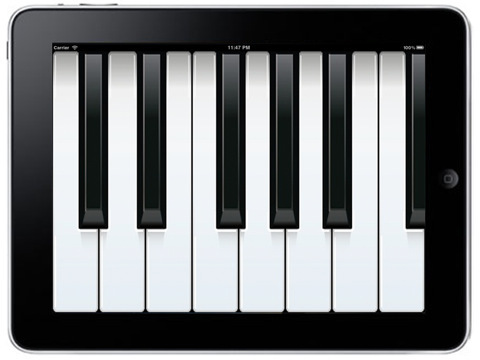 If you prefer to use a tablet, then it is equally simple to set up your personal wireless iPad piano control system. If you would like to request more information, request a demonstration of the QRS PNOmation PNO3, or order a unit for $6,500 installed, please fill out the "Contact Us" form below. We will contact you within 24 to 48 hours. UPGRADE to PNO3 today, and RECEIVE a 90-day trial of the ENTIRE MUSIC LIBRARY of over 10,000 songs. Recipients who respond to this offer will also receive another exciting bonus worth over $300 to extend your music trial to over 90 days. Call us at (866) 488-KEYS (5397) or click on the Paypal link, below. Do you currently own a Yamaha Disklavier™, PianoDisc, or Concertmaster™ player piano, and wish to UPGRADE to this system? Fill out the form below, or click on the Paypal link to purchase, and schedule an appointment. Or you may call us direct at (866) 488-KEYS (5397) to place an order. Already OWN a QRS System? WARRANTY EXTENSION: The QRS PNO3 2-year, 4-year, and 10-year music plan options include an extension of your QRS Music Systems warranty, by the corresponding year amount.